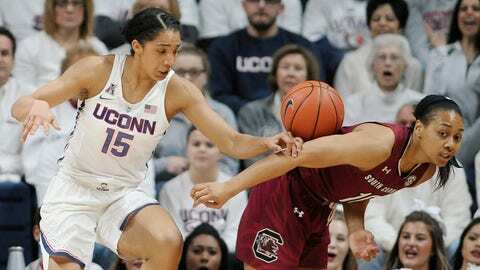 The University of Connecticut women's basketball team made history on Monday night when the Huskies won their 100th consecutive game in a 66–55 victory over South Carolina. The No. 6 Gamecocks became the latest victim of the 25–0 Huskies, who last lost a game in the 2014–15 season against then No. 6 Stanford. The parallel history proved to be no jinx for UConn as the team cruised to a win powered by a 26-point, 14 rebound night by Gabby Williams. South Carolina is now 21–3 this season, and 0–5 all-time against UConn. UConn next plays on Saturday at Tulane at 7 p.m. ET, and have just four games to go before closing out what could be their second straight undefeated season.